In 1994, Amazon was a small online company that was in the business of books. During that same time, Blockbuster was the industry leader in home video entertainment. Today, Amazon is in the business of everything (including home video entertainment), one Alexa upgrade away from taking over the world, and Blockbuster has gone from 9,000+ stores to just one. Amazon's success is a story of foresight, adaptability, and initiative; three words that are seldom used to characterize the church. While Blockbuster’s story represents the exact opposite. What is unfortunate is that the church at large more often resembles Blockbuster than it does Amazon with respect to these characteristics. We see this even clearer when we narrow down the scope to the western thought and approach to world missions. To put it plainly, the mainstream model for world missions is much like the business model of Blockbuster; currently out of step with the times and ultimately unsustainable. This is not to diminish the work that our brothers and sisters are faithfully doing around the world, but rather to take a step back and assess the structure that has facilitated their call to the nations and ask ourselves if there is a different way. Wave one: Just Go. 1792, William Carery, “the father of modern missions,” goes to India because he was convinced from Scripture that Christians were the means of conversion for non-believers which was not the popular thought at the time. Wave two: Go Inland. While most missional efforts centered around foreign ports of commerce and exchange up until now, men like Hudson Taylor who founded the China Inland Mission (now OMF International) sought to go inland and reach more people. This was also the wave that placed a great emphasis on contextualized living in the culture, both linguistically and socially. Wave three: Go Everywhere. This wave is marked by the unreached people group strategy which sought to identify all people groups of the world and specifically target those that had not been exposed to the Gospel in any meaningful way. This is rooted in the biblical relationship between the Great Commission and the second coming of Christ. How else can he come unless we go? The combination of these three waves serve as the foundation for much of the missional work that happens today in the sending of brothers and sisters to the undeveloped parts of the world. However, what is largely missing within these endeavors is the physical presence of the local church in these contexts. As it stands, world missionaries are often spread thin and operate outside of the biblical rhythms and structure of the gathered body of Christ, resulting in a disenfranchisement of the believers sent, and converts made in their context, all to their detriment. While this was maybe a necessary evil at times in history where much of the world was unknown, our current reality is that we are sending out to a shrinking world. Now is the era of urbanization and westernization, the massive moving of people from the rural into the big, global cities. Today, 1 in 8 people live in megacities worldwide, and by 2030 nearly all of global growth will happen in urban centers. Additionally, these cities have a common business language:, English. This means that the nations and peoples which we are trying to reach have gathered and are gathering in key global cities around the world. There is a fourth wave of missional history that has taken its cues from this and is now overlapping with the third: Go Strategic. The logic goes like this: our call is to the nations, the nations have gathered in key global cities, therefore we go to key global cities to answer the call. The global trend of urbanization and westernization has drastically changed the calculus of world missions and has created an environment that allows for a concentrated missional effort and a redemption of God’s ‘Plan A’ for world missions:, the local church. A group of us recently returned from a trip to one of these global cities, Dubai, where we got to see this first hand. 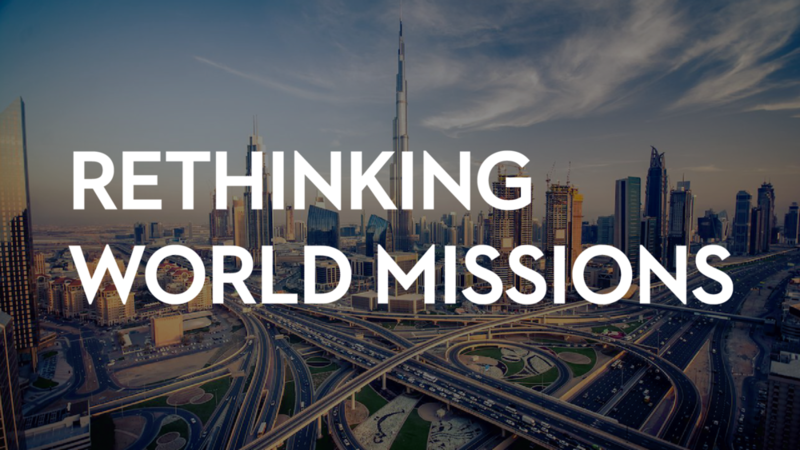 Redeemer Church of Dubai is an English speaking church of 1,000+ people from over 50 different countries of some of the most unreached places in the world, and has planted six churches in these unreached areas in the nine years they have been in existence. It could have been easy for Redeemer to set up as a spiritual hotel for expatriates looking for western familiarity, but rather they have set themselves up as bible-based, disciple-centric sending hub of believers. Many of them return to their own homes equipped to plant churches, that plant churches, that plant churches in a manner that is contextualized, not because of years of study, but because they are native to their land. The first three waves saw the need to take the Gospel to the nations from the outside in. This fourth wave has seen the nations come into the cities and is strategically aligned to organically send converted and equipped Christians back out into their local context for the sake of the Gospel. The Greek and Roman age was a time that was geographically, politically, and socially ripe for the rapid growth and expansion of the body of Christ in the known world when Jesus was born. In a similar way, the current and future global dynamics present us with a unique window of time that is ripe for the rapid growth and expansion of the body of Christ to the ends of the world. The worldwide trend of globalization and urbanization has brought unreached people groups out of their villages and into world cities, and it is incumbent upon us to have the foresight and initiative to strategically adapt to these times. May we be like the men of Issachar in 1 Chronicles 12 who were commended as men who had an understanding of the times, to know what the people of God ought to do.